Dimensions 13W x 15H x 9D in. 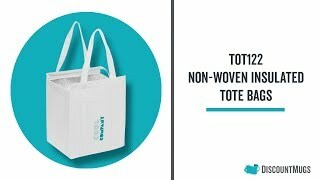 These non-woven insulated custom shopper tote bags are ideal for promotional gifts or giveaways. They are made of 80 gram non-woven and coated water resistant polypropylene. They have an insulated foam and aluminum wall inside. These totes are completely reusable and recyclable which makes them popular amongst many crowds. They come with 23” handles, a zippered closure and a front pocket. They will keep your food hot or cold. These bags are ideal for grocery stores, markets and traveling. You can choose from a variety of colors such as black, forest green, khaki, lime green, orange, purple, red, blue, white and yellow. Get them custom printed with your business logos, unique graphic designs or your choice of text. You can start customizing them now by using our online tools. Order these non-woven insulated custom shopper tote bags today and get free shipping plus our 110% price match guarantee. Very happy with these bags. Sturdy enough to hold our welcome items and attendees can use again! Great product - came exactly as I wanted. The insulated bag is large and will work great for groceries! So great! Such a quick delivery and great quality. Haven't been through all the boxes yet but seems that all have arrived. Pretty nice bag but disappointed that the plastic bottom wasn't included. The bag doesn't keep its shape without the bottom.